Always heard of guys hitting bombs with Cobras but never played one. Picked this up from a used equipment store. $40 and almost brand new. I cut a couple inches off the shaft and took it out today. Absolute monster. This thing just begs for you to smash the ball. I play in the 90's and usually hit 250 yds inconsistently. Once I got the hang of it I was smashing frozen ropes to 300! People four bays down at the range were stopping to watch. This thing is my excalibur. None. For the price now, this thing is a dream. Pulled this club out of the closet. Had a new grip put on it and driving the ball great. Had a TM 460 driver it seemed like I never could consistently hit in the fairway. So un retired this club. Hitting 280+ with my best at 326 since dusting off the cobwebs. 380 is plenty big and easier to hit with. Nothing like pulling 11 year club out to improve your game. Taylormade 460cc driver with that annoying white top. I am sick to death when I hear hot-shot players talking about the latest 'technology' being superior and a necessity in your bag. That propaganda merely drives sales at your local golf shop. This Cobra SS 380 driver proves it! I think the 480 sized drivers look ridiculous and are un-necessary. Where is that going to stop? I've been using a Yonex Nanospeed for the last year and a Cobra 460 F Speed before that. I have always been a long hitter and developed that type of swing with the 380, years ago. I was brainwashed into buying larger drivers since then. Two days ago I decided to switch out my driver from the Yonex 480 to the Cobra 380 just for kicks. WOW!!!! It was a joy to swing and hit. That ball went further than with the larger club. I let a couple of friends try the club and they were blown away as well. After doing some internet searches they told me that the Cobra SS 380 club is hard to find. Owners just don't part with them. Find one, buy it and I turn your nose up at the 'equipment snobs' when you drive your ball beyond theirs. I'm going to be looking more closely at other clubs I've had collecting dust. Personally, I think successful play comes from a good relationship of equipment and player along with the discipline of practice. All said this is a classic club that won back it's place as my number one driver. By the way, the same is true with putters in my book. Good golfing! I have had this driver for about 7-8 years. I have played a lot with it, including 4 seasons of high school golf and it still has tons of pop. I have been recently looking for a new driver, but the only one that seems to give me a bit more distance is the new Titleist D3 (incredible by the way), which to me is not worth $500. I am by no means a large person (5'11'' 155) but when I'm at the range, it's always fun dropping bombs past guys that are 40-50 lbs bigger than me. If you're a traditionalist like my dad and you are looking for a bit more distance but don't want a 400+cc driver, give it a try. Or if you have never hit a Cobra and are looking for a glimpse into their drivers, I strongly recommend this club. r580, most titleists in the last decade. Since my last posting on the 380 I've tried a number of other drivers. The 380 keeps reminding me why I should keep it: long, straight drives. Ball flight is higher than the 9 degree loft suggests. This head really works well in concert with the YS-6 shaft (stiff). On that note, you can get a 380 cheap on ebay and upgrade the shaft (as they say the engine of the club)for far less than you'd pay for a new 460 cc driver. I'm not a big hitter but this club helps me get it out there (250-260 yds - a good distance for me) when I have to. Email answers to techincal questions have been prompt. Very long and forgiving driver. Fun to hit! I reshafted with YS-6 stiff, which seems to work very well in concert with the 380 head. Trajectory is high to medium-high and distance is excellent. As face is 2.5 degrees closed, you have to watch out for hooks. I have compared the SS 380 with a number of 460 cc drivers and have found that it has out-performed them. 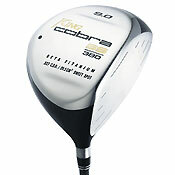 I also like the Callaway Big Bertha 2004 titanium driver (again with the YS-6) but the SS 380 is longer. Cobra engineers/marketers have made the Cobra drivers louder tha they need to be. I've driven better with this one than any other. I'm a lefty and work the ball left to right so 2 degrees closed is perfect. I tried the 427 but it was more inconsistent. The plasma weld and sound of this 380 must be what sets it apart. My swing speed is 91 and the regular flex Harrison Striper I put in mine compliment my game well. These can be had on eBay very reasonable. If you like a straight ball to a draw give it consideration. This is by far the best driver that I have ever hit. I have just about tried all the new drivers nn the market like taylormade r7 and r5 and nothing compares to this. I play high school golf in michigan and don't play year around but I hit this driver about 275 on average which I think is pretty incedible for only being a sophomore. I would highly recommend this driver to everyone looking at a new driver. Three words. Believe the hype!!! I was never a big believer in the new technology. Put it this way, I was pretty stubborn in regards to refusing to carry around "one of those emormous drivers". But I began to get tired of going golfing with my father and having the "old man" consistantly out-driving me with his "beast of a driver" (Snake Eyes Fired Forged, not even that large compared to some of the 400+ drivers) So the search began. Thanks you you all here at golfreview.com, the decision was made, the auction was won and the Cobra was on its way. Drove directly to the driving range to try her out. First hit, right down the pipe...pretty long! Nice. Second hit, right down the pipe, even longer. Wow. Needless to say, I had to stop halfway through the bucket because I couldn't stop laughing. I couldn't seem to NOT hit a ball down the middle. So I gathered myself, and once I started up again, I got distracted by somebody yelling in the background. "Hey, stop hitting them over the fence!!" Wait, was he talking to me??? YEAH HE WAS!!! I've gained probably 15-20 yards with this thing. I went from a 10.5* to this 9* but still hitting just as high (not too high) I will probably re-shaft at some point, as the 5.1 Stiff Shaft just isn't all that stiff and, when I crank one up, I have a tendency to lose a couple to the left (lefthanded). But no complaints here. I am one proud new owner of "one of those emormous drivers!!" The only other driver that I've hit (other than into nets at the shop) is my XPC Plus 10.5 Offset. But that is no where near "similar" to the Cobra.